How Does Subsea Processing Work? While subsea developments have been made possible by technologies such as subsea trees, risers and umbilicals, subsea processing has been an elusive solution for many years. Whether describing subsea separation, re-injection or boosting, subsea processing has helped to revolutionize offshore developments worldwide. 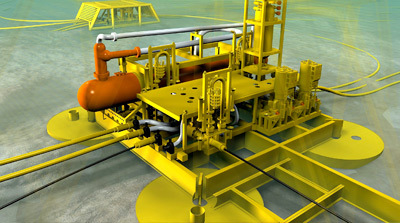 With production equipment located on the seafloor rather than on a fixed or floating platform, subsea processing provides a less expensive solution for myriad offshore environments. Originally conceived as a way to overcome the challenges of extremely deepwater situations, subsea processing has become a viable solution for fields located in harsh conditions where processing equipment on the water's surface might be at risk. Additionally, subsea processing is an emergent application to increase production from mature or marginal fields. Saving space on offshore production facilities, separation of water, sand and gas can now be performed subsea. Subsea separation reduces the amount of production transferred from the seafloor to the water's surface, debottlenecking the processing capacity of the development. Also, by separating unwanted components from the production on the seafloor, flowlines and risers are not lifting these ingredients to the facility on the water's surface just to direct them back to the seafloor for re-injection. Re-injection of produced gas, water and waste increases pressure within the reservoir that has been depleted by production. Also, re-injection helps to decrease unwanted waste, such as flaring, by using the separated components to boost recovery. On deepwater or ultra-deepwater fields, subsea boosting is needed to get the hydrocarbons from the seafloor to the facilities on the water's surface. Subsea boosting negates backpressure that is applied to the wells, providing the pressure needed from the reservoir to transfer production to the sea surface. Even in mid-water developments, subsea boosting, or artificial lift, can create additional pressure and further increase recovery from wells, even when more traditional EOR methods are being used. There are a number of reasons why operators may choose to install subsea processing equipment. First of all, most subsea processing will increase the recovery from the field, thus increasing profits. Additionally, by enhancing the efficiency of flowlines and risers, subsea processing contributes to flow management and assurance. Also, subsea processing enables development of challenging subsea fields, while reducing topside expenditures for equipment. Furthermore, subsea processing converts marginal fields into economically viable developments. 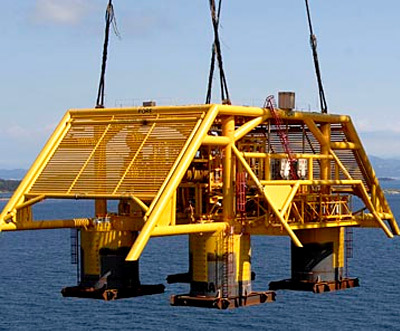 Offshore fields worldwide have encompassed subsea processing into their developments. 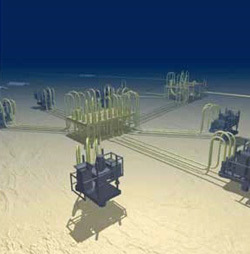 Whether the fields are mature and the subsea processing equipment has been installed to increase diminishing production, or the fields incorporated subsea processing from the initial development to overcome deepwater or environmental challenges, the innovative subsea processing systems have enabled the fields to achieve higher rates of production. While subsea processing has long been a dream of upstream engineers, the technology has just recently been put into practice. With the successful start-up of the world's first full-field subsea separation, boosting and injection system on the StatoilHydro-operated Tordis field in the North Sea in 2007, the dream became a reality. 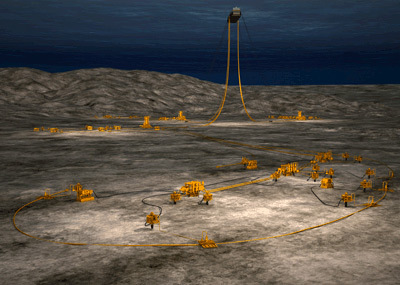 Through subsea processing, the mature Tordis oil field increased recovery by an extra 35 MMbo and extended the life of the field by 15 to 17 years. Shell's BC-10 project offshore Brazil was the world's first subsea system with gas/liquid separation and boosting. Developed via 13 subsea wells, six subsea separators and boosters, and an FPSO, the BC-10 project began producing heavy oil from ultra-deepwaters in July 2009. Expected to come on-stream in 2011, Total's Pazflor project offshore West Africa is utilizing the region's first-ever subsea gas/liquid separation system. One of the world's deepest water developments, Shell's Perdido project in the US Gulf of Mexico is currently under development and will also incorporate subsea boosting and separation to achieve production. There are a number of oil services companies that presently offer subsea processing equipment. Leaders in this innovative solution include Cameron, Expro, FMC Technologies and GE Oil & Gas.